With the DataTrap II™ Data/VOD Recorder the only thing that you need is data to be measured. This instrument is capable of measuring 8 different channels of ± 10 Volt DC of data at a speed up to 10 MHz. 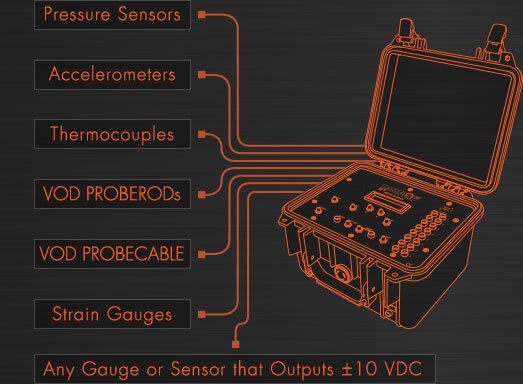 The battery operated unit is capable of operating 6 continuous hours of data collection with the memory capable of being divided into 32 different tests before the unit is required to be downloaded. There are upgrades available for the DataTrap II™ Data/VOD Recorder that includes two memory upgrades, VOD upgrade and a strain upgrade. With the memory upgrades, the unit can be upgraded from 64 million to 128 million with the Enhanced Memory and to 256 million with the Maximum Memory. The VOD Upgrade will allow the unit to measure up to 8 channels of VOD data. With this upgrade, the user can select any configuration for the channels with regards to scope or VOD. With the Strain Upgrade will allow the DataTrap II™ Data/VOD Recorder to measure strain gauges with a resolution of up to 3000 microstrains. With this upgrade will allow the user to configure the channels to measure scope or strain. With both VOD and Strain Upgrades installed, the unit will be able to have the 8 channels able to measure any of them as the user requires. If 8 channels is not enough data, the DataTrap II™ Data/VOD Recorder can be synchronized with up to 6 more units to allow a total collection on a common timebase of up to 56 channels. A DataTrap II™ Data/VOD Recorder is a very important instrument when dynamic sensors are needed to be measured when the signal change occurs extremely fast. The DataTrap II™ Data/VOD Recorder can sample the data up to 10 MHz or quick changing samples to provide granularity of the signal and provide the shape of the waveform. For example, scope data can measure a variety of sensors including Pressure Sensors, Accelerometers or any other ± 10 Volt DC Signal. The unit can also have a slower sample speed to measure the gradual change over a longer period of time. The recording rate can be decreased to 1 Hz to allow a long sampling time. For example, the unit with Maximum Memory measuring 8 channels at 1 Hz will allow for 370 days of recording in a single file. With the slower record times, slower sensors can be recorded as well including Thermocouples. With the optional VOD upgrade, the DataTrap II™ Data/VOD Recorder can be anywhere between 2500 to 9000 m/s, therefore an equally quick instrument is required to measure the change. For more information, click here. 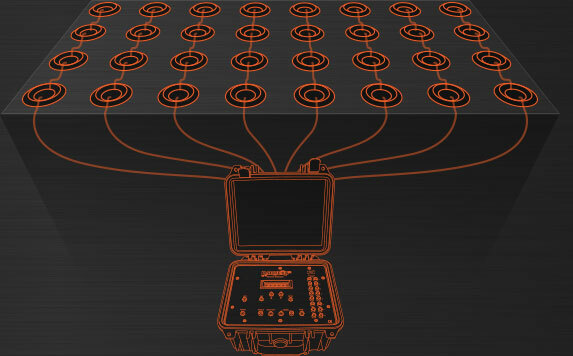 Using the DataTrap II™ Data/VOD Recorder, the VOD PROBECABLE can be placed in multiple holes to measure the VOD of the explosives in the hole, the timing of the holes, length of column of explosives above the booster, the location of the booster in the first hole, the effectiveness of the decking material and many more. With the DataTrap II™ Data/VOD Recorder a single length of VOD PROBECABLE per channel multiple pieces of data can be collected. This will extend the functionality of a single channel of data. 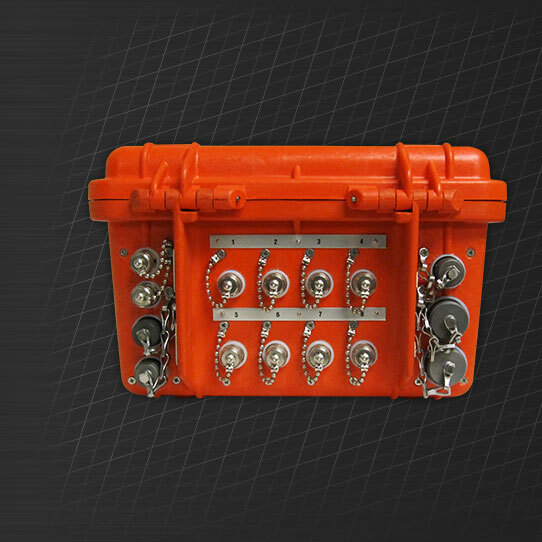 With the VOD Upgrade, the DataTrap II™ Data/VOD Recorder can use multiple channels to record multiple holes that are designed to function simultaneously.